This tool can adjust to lift different size sheets. Problem: Customer would have a full skid of sheet metal to load onto a table. Due to the weight and size, the customer was using two operators to load their table. Requirement: Pick up customer's sheet metal weighing up to 300 pounds utilizing just one operator. The tooling was required to lift from 18 inches high to 40 inches high. The max size of the sheet metal was 5 feet by 5 feet. This made it difficult to handle with one person. Solution: Due to the overall size of the sheet metal, we were required to provide a multiple cup solution to prevent the part from deforming. If the part were to deform, we could have an issue with the vacuum cups pulling away. 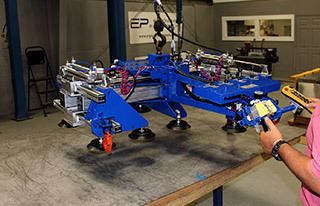 Ultimately, we provided a six cup sheet metal lifter system with more than enough capacity to handle the sheet metal. Result: The customer was able to remove one operator from the area while also decreasing the risk of a lifting related injury. Overall a win/win for the end user.